As Dom-Dirk noted in his review of The Thing, the ‘classic horror’ movies of the 1930s – 1950s were the stock-in-trade of BBC2 for the later period of the 70s to the mid-1980s. Universal and RKO horror films were played on a loop over an 18 month period. This was the only opportunity to see these films as VCRs were not available, we were dreaming about having 8 minutes of Star Wars projected on to our bedroom wall. Science Ficition magazines during this period would celebrate these films as classics of the genre (if they deserved it or not) , which made them more alluring, so the discerning film audience would have to seek them out on the TV schedules. There was an interesting shift, from my memory, as horror films used be late night faire that appeared after Match of the Day, however by the early 80s they were appearing at the tea-time slot on BBC2. The passage of time seemed to neutralise their effects, which means that by my calculation, Dario Agento’s SUSPIRIA (1977) is ripe to replace The Weakest Link in the BBC1 schedule shake-up. I knew much more about The Thing before I actually saw it. In STARBURST Vol 1 Number 12, circa 1979, there was a Starbust SF Classics feature that makes the point that it was genre defining and unique in its blend of gothic horror and science fantasy. With the imminent release of ALIEN (1979) the article notes that its uniqueness will be challenged, but it will always remain an important film because it was the first of its type. Tise Vahimagi, the article’s author, also speculates on the authorship of the film, noting that Nyby needed a director credit to enter the guild, so Hawk gave him The Thing. My favourite piece from the period appears in STARLOG: THE MAGAZINE OF THE FUTURE which had a broader editorial policy than STARBURST casting its net wide to provide less of more. 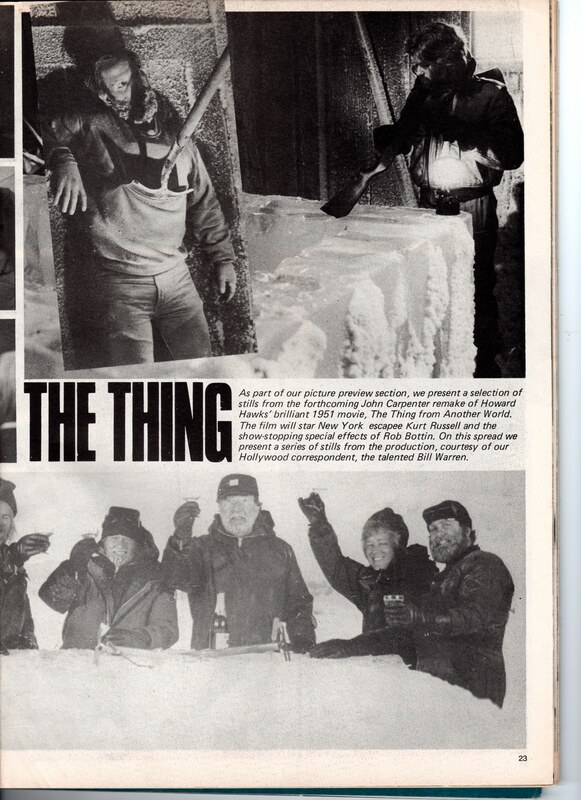 There is a one page feature in their August 1979 which presents the secrets behind the special effects of the film. 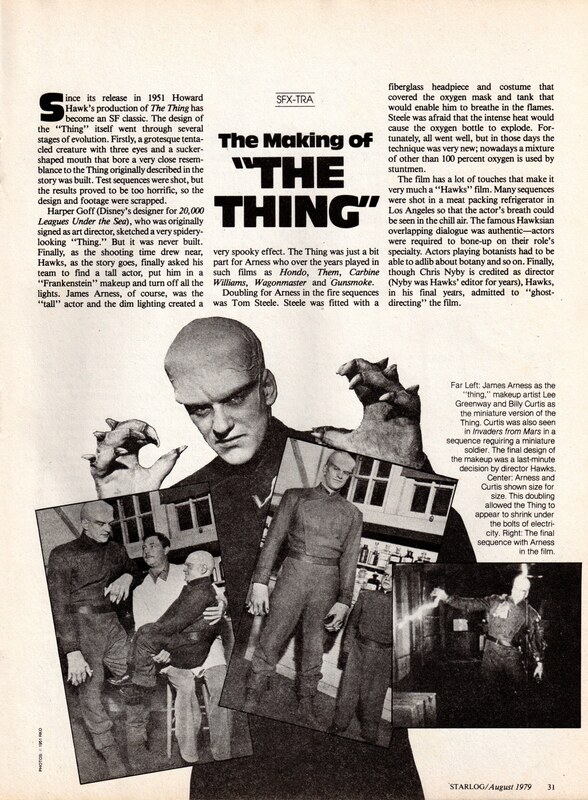 In this article the magic of the effects is dispelled by the startling revelation that the giant actor James Arness who played The Thing had a miniture-double played by Billy Curtis who was half his size. He had previously appeared in the INVADERS FROM MARS as a miniature soldier and was given this plumb role despite having to walk through fire wearing oxygen tanks. Apparently, the original concept of The Thing was a spidery-looking monster, but the concept drawings were discarded as they were considered too horrific. This story is verified by Anne Billson in the BFI Modern Classic pamphlet. It is perhaps surprising that the original publicity shots for John Carpenter’s remake did not feature the creature itself, instead they included the camaraderie of the actors and the depiction of fairly conventional deaths of the characters (some of which I’m sure didn’t make the final cut, unless I missed something). The images from the film seem so innocuous, I’d be happy for my kids to watch them at tea-time.